Mechanical Engineering is the application of the principles of physics in the analysis, design, manufacturing and maintenance of mechanical systems. Mechanical engineering is one of the broadest and most versatile of the engineering professions. Department of Mechanical Engineering was established in the year 1998 and was accredited by the National Board of Accreditation (NBA). The department comprises of major areas viz. Thermal Engineering, Design & Dynamics, and Manufacturing Engineering. The specializations of faculty members cover all major areas of Mechanical Engineering. The department has adequate faculty members, most of them having pursued/ pursuing their Ph.D. The department also organizes several training programmes, workshops and seminars for staffs and students every year. The department has 7 Clubs/ Associations to invoke interest and create awareness among students in different fields of Mechanical engineering. Value added programmes in NDT, CATIA, ANSYS, CFD etc. are conducted every semester. 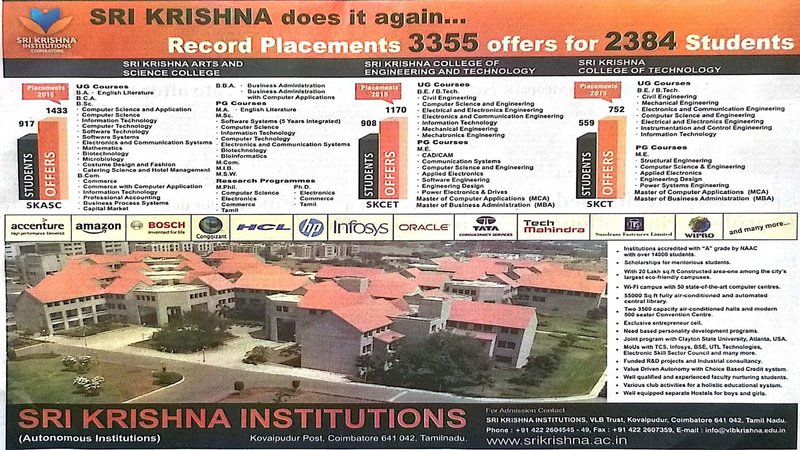 To produce world class mechanical engineering graduates by promoting core technical competency blended with advanced computing skills, creative thinking and desire to upgrade continuously, so as to empower them to the expectation of the industries in our country and abroad and also to impart the interpersonal skills and make them realize the values of life. The department aspires to produce academic leaders in mechanical engineering with moral values and desires to set up centers of excellence in innovative design and testing, composite materials, automation, automotive technology and green fuels. PEO1 Provide strong foundation in the science and engineering fundamentals necessary to formulate, solve and analyze real time mechanical engineering problems. PEO2 Develop the ability to synthesize data and technical concepts for making decisions in an ethical manner considering the socio-economic scenario. PEO4 Prepare for successful careers in industry that meet the needs of Indian and multinational companies and to inculcate the qualities of continuous learning and entrepreneurial skills. PO-A An ability to apply knowledge of mathematics, science, and engineering fundamentals in order to solve mechanical engineering problems. PO-B An ability to design and conduct experiments, as well as to analyze and interpret data using research based knowledge to give suitable conclusions. PO-C An ability to design a system, component, or process to meet desired needs within realistic constraints such as economic, environmental, social, political, ethical, health and safety, manufacturability, and Sustainability. PO-D An ability to function as an individual and as a member or leader in diverse teams, and in multidisciplinary settings. PO-E An ability to identify, formulate, research literature and analyze complex engineering problems reaching substantiate conclusions using first principles of mathematics, sciences and engineering. PO-F An understanding of professional and ethical responsibility and norms of the engineering practice. PO-G An ability to communicate effectively on complex engineering activities with engineering and society communities and write reports, documentation and presentation effectively. PO-H An ability to understand the impact of the professional engineering solutions in a societal and environmental context and demonstrate the knowledge of, need for sustainable development. PO-I A recognition of the need for, and have the preparation and ability to engage in independent and life-long learning in the broadest context of technological change. PO-J A knowledge of contemporary issues (Our interpretation of this includes presenting students with issues such as the impact of globalization, the outsourcing of both engineering and other support jobs as practiced by modern international companies). PO-K An ability to create, select and apply appropriate techniques, resources and modern engineering and IT tools including prediction and modeling to complex engineering activities with an understanding of the limitations. PO-L An ability to fabricate real time mechanical systems and test its worthiness. 1. CAD Laboratory The Computer Aided Design lab is equipped with 66 work stations of high end configuration. The lab is also equipped with latest modeling, analysis and simulation softwares like Creo, Inventor, Auto CAD, ANSYS, HYPERMESH, Solid works and ADAMS. 2. Dynamics and Instrumentation Laboratory The devices here are meant to measure the different properties like pressure, vacuum, temperature, power, speed, stability, balance etc. 3. I.C. Engines Laboratory The amount of work that an engine is required to do is measured by Hydraulic Loading, Electrical Loading and Mechanical Loading in this lab. (Engines available are also differing from each other). For example two stroke/four stroke, petrol/ diesel, single cylinder/ twin cylinder/ multiple cylinders etc. are available. Multi – fuel VCR engine with DAC facility is also available. 4. Thermal Engineering Laboratory Wind tunnel for lift and drag measurement, two-stage air compressor centrifuge blower, refrigeration, air conditioning rigs are the primary equipments available in this lab. Oil fired low pressure Boiler along with steam turbine set up provides facility for heat transfer analysis. 5. Lathe Shop All varieties of lathes including Turret lathe, all Geared lathe and Cone pulley lathe are the used for machining purpose. Tool dynamometer is available for force measurement. 6. Special Machines Shop Here students come across all varieties of special purpose machine tools, viz. Gear Hobbing Machine, Milling Machine, Radial Drilling Machine, Grinding Machine, Shaping Machine, Planer and Slotting Machine. 7. Strength of Materials The laboratory has equipment for testing materials for shear, impact, hardness, etc. digital UTM 40T, CTM-100T and other robust equipments add value to the laboratory. 8. Foundry Shop The foundry shop has spacious pit for practicing mould preparation. Electrostatic furnace is also available for melting the metal. 9. Smithy Shop Five black smithy furnaces are available for forging various shapes of metals by the way of supplying the required heat. 11. Plumbing The students practice basic house hold and industrial plumbing joints in this workshop. 12. Materials Science and Engineering Laboratory Foundry sand test equipments, Jomney end Quenching apparatus, Camera integrated microscopes, Material test devices and muffle furnace are the part of this lab. 13. Metrology Laboratory All kinds of Mechanical measurements to very close tolerances are possible here. Major instruments are Profile Projector, Floating Carriage Micrometer, Auto Collimator, Comparators and Gauges of different kinds. 14. Fluid Mechanics and Machinery Laboratory This lab is equipped with all flow measurement devices, hydraulic machineries, turbines and pumps. 15. Carpentry Laboratory The students practice the basic wooden joints like lap, half lap and dove tail joints in this workshop. 16. Sheet Metal Shop The students develop the sheet metal and make small items like funnel and tray in this lab. 17. Fitting Laboratory The students learn to cut the metal and make simple joints in this workshop. 18. SAE Laboratory The students actively involve themselves in making the All terrain Vehicles, Formula 3 Vehicles, Go Kart and Eco Kart in this Lab. 19. Research and Development Lab-1 The lab has equipments like micro hardness tester, pin on disc tester, Image analysis system etc., which helps the faculty and students for doing their research level project. 20. Research and Development Lab-2 The lab has equipments like Squeeze Casting Setup, Compression moulding machine, Impact testing machine, Surface roughness tester etc., which helps the faculty and students for doing their research level project. The department of Mechanical Engineering is one of the versatile and foremost departments of SKCET. The department has 21 labs with two labs for Research and Development and two more labs of student’s projects. The department is permanently affiliated to Anna University since 2006 due to its infrastructure and facilities. Clubs and associations in the department promote innovative thinking among the students. The department has eight clubs and associations like Society of Automotive Engineers, Institute of Indian Foundrymen, Association of Mechanical Engineering, etc. Students are involved in funded projects obtained from DST, AICTE, UGC, etc. Joint journal publications and patenting with faculty members are encouraged. Students are molded to the requirements of the industry through industry based curriculum, internships, extramural activities, etc.